In several thrift store trips this month, I stocked up on some warm-weather clothes and was ready for the first warm days. In all, the purchases totaled $13, and the retail price for the items was approximately $180, resulting in a savings of $167. Not bad! 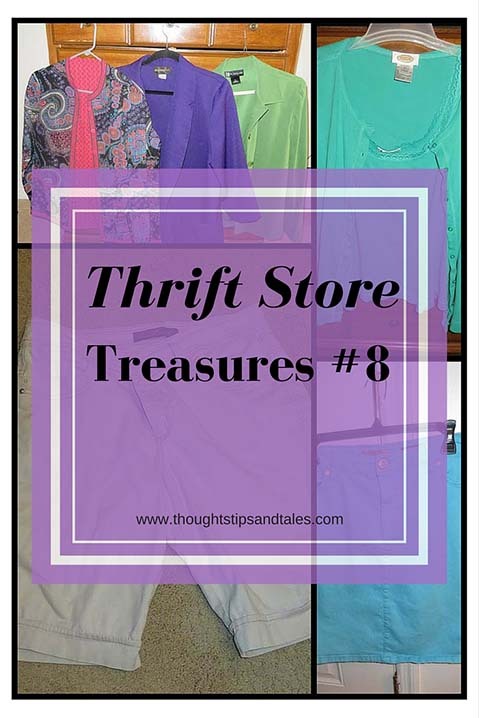 This entry was posted in bargains, fun, life, saving money, thrift store treasures, thrift stores and tagged bargains, money saving, saving money, thrift store treasures, thrift stores. Bookmark the permalink. Wow that’s a deal for sure! It’s all about the deals! You still like bright colors! That’s one difference–I’m stuck on navy and black. Enjoy the pretty new clothes in the beautiful spring weather! Elisa, Had to laugh when I read your comment because I know I love bright colors now but didn’t realize I did back in college, too! It’s nice to have a friend who remembers you when. Have a nice holiday weekend!